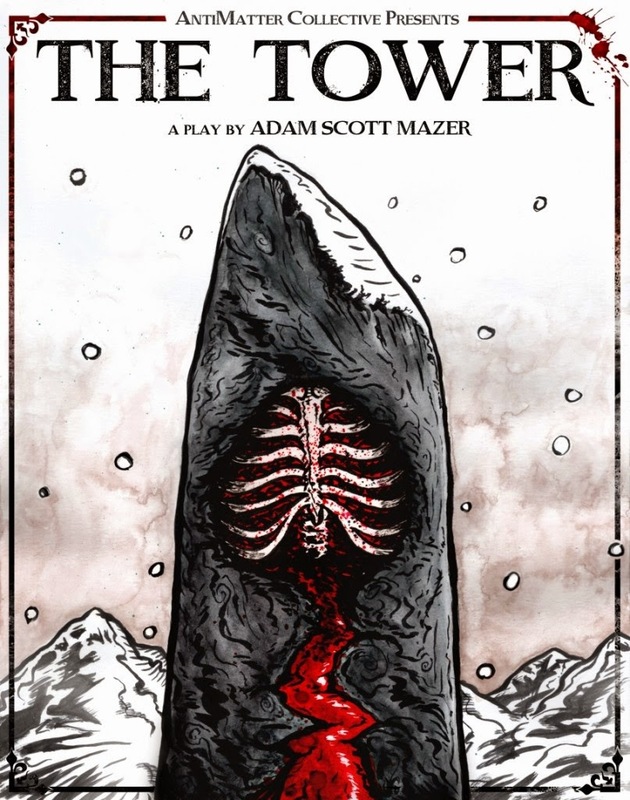 "...'badass' to me implies a sort of incisive directness and an ability to balance entertainment with a genuine exploration of the things that terrify us..."
What is The Tower about? The Tower is about the Donner Party, a now-legendary group of westward pioneers who got trapped in the Sierra Nevada Mountains in the winter of 1846-47 and had to resort to cannibalism to survive. The play tells the story of two groups - one that sets off across the Sierras on snowshoes in a desperate drive to get help, and another that waits out the winter in makeshift cabins at what is now called Donner Lake. The Tower travels through time, through the hallucinating minds of starving people, and possibly even through death itself, ultimately presenting a strange and possibly unsettling portrait of adolescent America. What has been its development? It's been an amazing process! I had the idea to write about the Donner Party several years ago, but it really all started last May. I brought Philip Gates and Maya Rook - the director and dramaturg, respectively - onboard the project before even a word had been written, and we held a two-week developmental workshop with a bunch of amazing actors. Maya - a Ph.D. History Student - lectured on the history of cannibalism and the westward expansion phase of American history and brought in a number of historical documents, which Phil, the cast, and I then staged. We also worked with character-based improv and experimental dance and movement compositions. After our final workshop performance at Five Myles art gallery, I came away with a wealth of amazing material. In the fall, Maya, Phil, and I traveled to Donner Lake to meet with historians and really delve into the energy of the place. 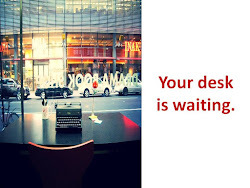 That trip jumpstarted my creative drive, and I began writing the actual script shortly thereafter. What made you interested in writing about the Donner Party? It's got a lot of my favorite themes - extreme conditions, mounting desperation, the fractured experience of time, the infinite creative potential of the mind, the fine line between human and animal, and the contrast of the mythic and the mundane - it all seemed like it'd be great fodder for drama. How did the psychedelic theme in the production develop? 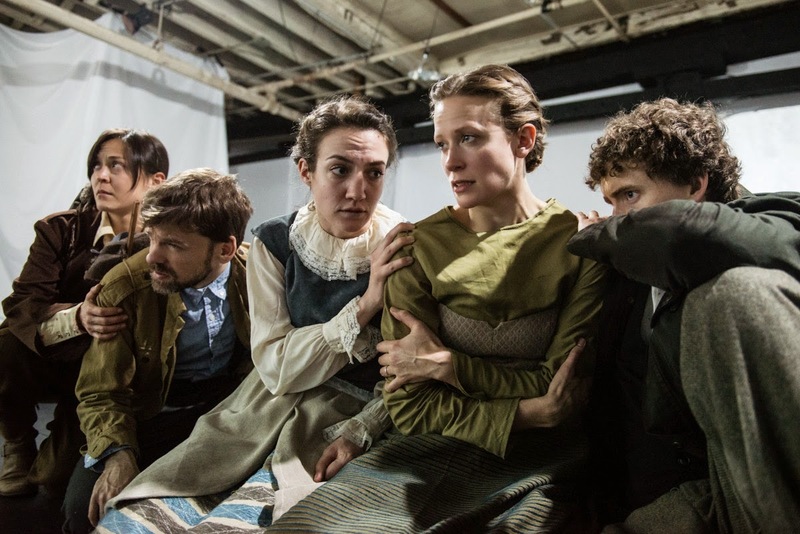 When I originally came up with the idea of writing a play about the Donner Party, I knew almost nothing about the actual history, but I did know that two hours of watching people slowly starve to death does not an interesting play make. I've always enjoyed writing the little bits of psychedelia in my previous plays - Death Valley had a couple bizarre dream sequences, for example - and I knew that I wanted to push myself to expand my creativity in unexpected directions. 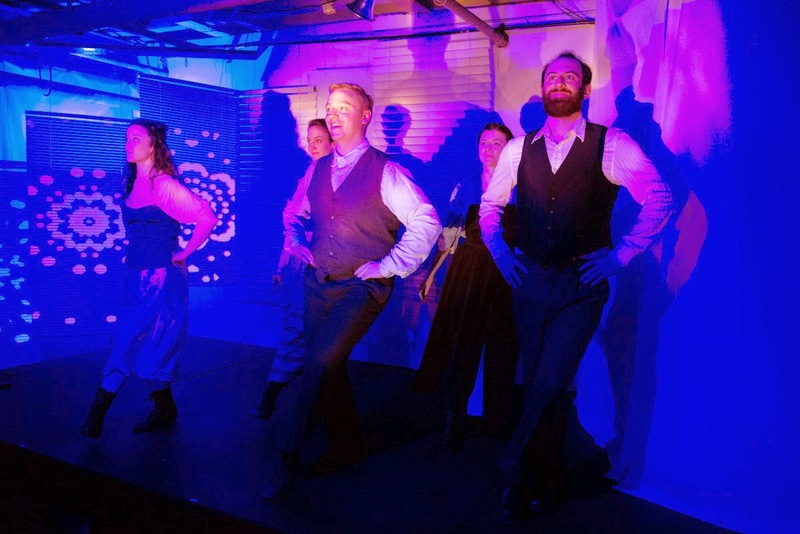 Because there are so many questions about the Donner Party, not to mention the fact that we'll never know what they were really thinking or feeling, it seemed appropriate to explode the minds of the characters all over the stage. How does AntiMatter Collective develop/create work? It varies! This was certainly one of our more collaborative processes, starting without even a script. Each developmental process fits the work being created, but it always involves collaborative discussion and play between the actors, the director, and the writer. I think it's important to keep an open mind about the process by which a play is created - figuring out the "how" is part of the fun! How did the Collective come into being? Dan Rogers and I were asked to do a show for Vampire Cowboys' (sadly defunct) SaturdayNight Saloon Series of episodic plays. We came up with the zombie western Death Valley, which got an enormously positive reaction from the Saloon audience. Figuring we had something good going, I reworked the episodes into a full-length script, and Dan and I brought on Will Fulton to co-produce the play in June 2011 at the Bushwick Starr. Figuring any good company needs a name, AntiMatter Collective was born! Well, in our longer mission statement, we use the word "unflinching," which I think gets a little more at what you're asking about. 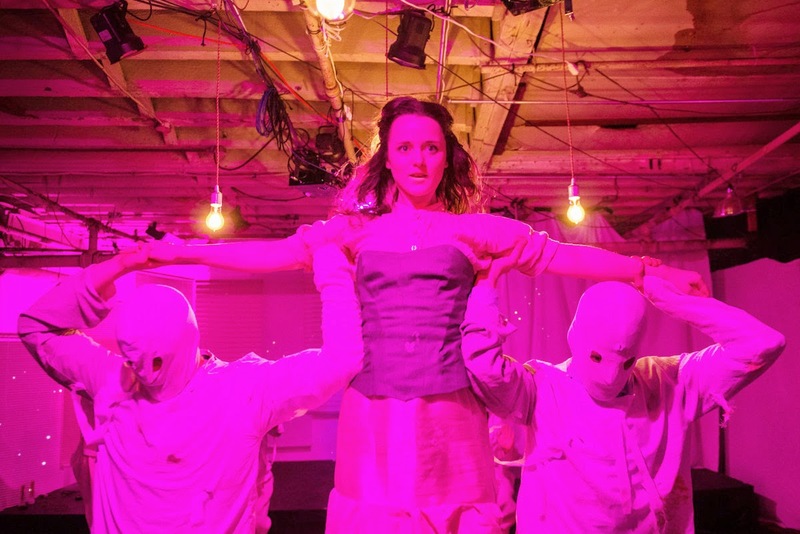 AntiMatter is unafraid to tackle big, terrifying themes and subject matter that might not usually be seen on the stage (our past shows have included zombies, the devil, and the robot apocalypse, respectively). But more than that, "badass" to me implies a sort of incisive directness and an ability to balance entertainment with a genuine exploration of the things that terrify us - death being foremost amongst them. We'll always give you a good night at the theater, but the dreams you have afterward might not be so pleasant. What other productions have you worked on with the AntiMatter Collective? All of 'em! I wrote our first show, Death Valley, and our last show, Motherboard. Between those two, I performed in Gregory S. Moss's sixsixsix, which we staged as a double feature with an H.P. Lovecraft adaptation, all under the title Demonology. Sleep, dinner, and a party or two. I've found that the whole "one show a year" model of independent theater companies doesn't work for us - at least not yet. I much prefer to take a little more time with development, so we can make sure the shows are rock solid when we do produce them. I have a few ideas of what AntiMatter's next project could be, but I'm looking forward to taking a couple months to relax and recharge first. Salted Caramel - in classic American fashion, I want it all at the same time. The Tower is playing at StandardToyKraft (722 Metropolitan Ave.) until April 26th. For tickets and more information click here.